A 13-year-old boy was left clinging to a cliff face by his fingernails after he started to climb it but got stuck. Coastguard teams and a search and rescue helicopter winched the child to safety from the 330ft (100m) cliff face in Langdon, Kent, on Friday. Dover coastguard said the teenager started climbing from a terrace cut into the middle of the cliff. He was 175ft (53m) from the bottom when he found himself unable to move up or down. 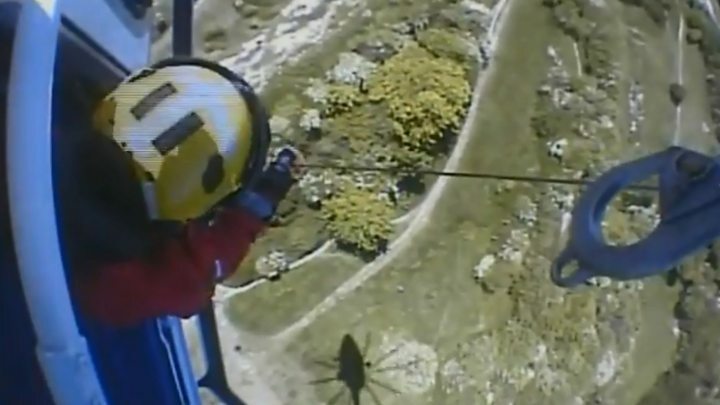 HM Coastguard helicopter captain James Lorraine said the rescue was particularly difficult because of the boy's "extremely perilous position" on the cliff near Dover. He said the child had been stuck for about 30 minutes when he was found, and rescuers knew he could not hold on much longer. After they were unable to reach him because of the dense shrubbery, the helicopter took over "with only minutes to spare", he said. "Thankfully, the rescue went smoothly and the boy was reunited with his family at the base of the cliff." The child had scrapes and bruises, but area commander Matt Pavitt said it was a miracle he escaped without injury. "He was very, very lucky," he said. "The boy had been clinging on by his fingernails to stop himself from falling from the sheer rock face for just over 30 minutes and if he had let go this would have been a very different outcome." Fresh warnings have been issued to people visiting the coast to be aware of the dangers of the cliffs.